Another year, another ThinkPad. But are there enough improvements in Lenovo’s latest upgrade? Aimed primarily at business folk, Lenovo’s ThinkPad range has long been regarded as the gold standard in ultraportable workhorse laptops. The 2018 ThinkPad X1 Carbon, now in its sixth -generation, is no exception. As light and classy as last year’s model, the 2018 X1 Carbon also has a brighter, more vibrant screen and a faster Kaby Lake R processor. Just like last year, however, it has an arch nemesis in the form of the latest Dell XPS 13. In 2017, the XPS 13 proved to be the superior laptop, and it was cheaper too. Which of the 2018 models you go for will depend on a number of factors. Arguably, it will be a tougher decision than it was last year. The latest Lenovo ThinkPad X1 Carbon is yet another in a long line of formidable, powerful, and lightweight business laptops from the Chinese manufacturer. It has a 14in IPS display, available in either Full HD or Quad HD resolutions, with touch screen models also available. The specific configuration I am reviewing here is powered by a Kaby Lake R Intel Core i7-8550U chip with 16GB of soldered on RAM and an integrated Intel UHD Graphics 620 GPU. For storage, we’re looking at a 512GB PCIe SSD. Our review model also has a gorgeous display with a resolution of 2,560 x 1,440; the Quad HD screen was available in the 2017 X1 Carbon but, as you’ll find out, there have been some significant improvements in this area. 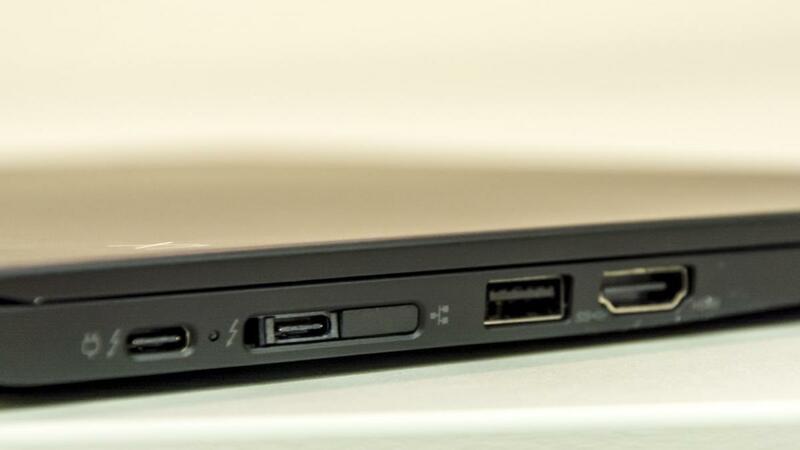 As is expected of a business machine, the X1 Carbon also has an array of connectivity and security features not seen on most ultra portables. In terms of size, weight, and appearance, the X1 Carbon 2018 is nigh on identical to the X1 Carbon 2017 – far from a bad thing. For the configuration which I’m reviewing here you’ll have to fork out a hefty £1,879, which places it towards the higher end of the line. Cheaper editions have either less RAM, less storage, a weaker Intel Core processor, or a lower display resolution – or frequently all of the above. The touchscreen models, only available with Full HD models, can be had for as little as £1,440, but will be considerably more expensive if you want the Intel Core i7-8550U or higher. As discussed previously, the key rival of the 2018 X1 Carbon is this year’s 13.3 ultraportable Dell XPS 13. 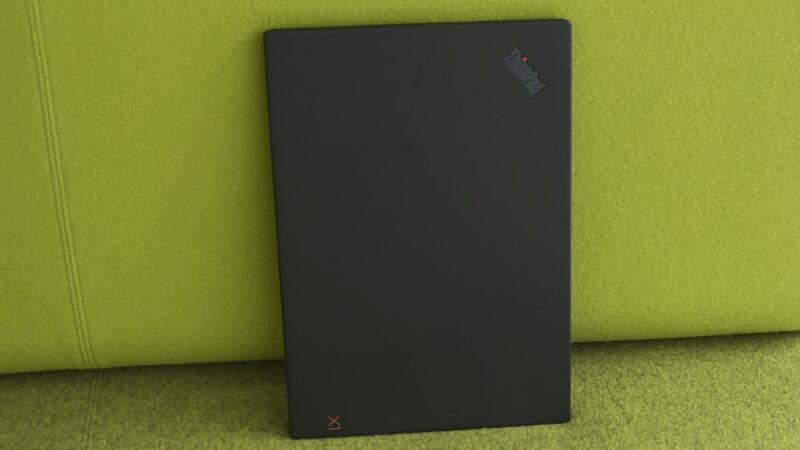 The configuration we reviewed has an identical processor and RAM to this X1 Carbon and costs £1,649. That’s not quite the top spec, as a (hard to find) 4K touchscreen display model is available for £1,800. Also in the mix is the Huawei MateBook X Pro, a £1,309 14in laptop which also boasts an Intel Core i7-8550U processor. For its price, the MateBook X Pro packs a serious performance punch, and it’s no lightweight when it comes to battery life or 4K benchmarks either – although at 1.3kg, it does have a lightweight design. Its 3,000 x 2,000 display resolution betters the laptops listed above, and it has a Nvidia MX150 that edges out the Intel UHD Graphics 620. Great minds think alike, and great ThinkPads look alike. Yes, the Lenovo ThinkPad X1 Carbon (2018) has a remarkably similar design to last year’s model, with a couple of subtle changes. Like its predecessors, the X1 Carbon is comprised of carbon and glass fibres, plastic, and magnesium alloy, combining for a sturdy yet incredibly lightweight build. 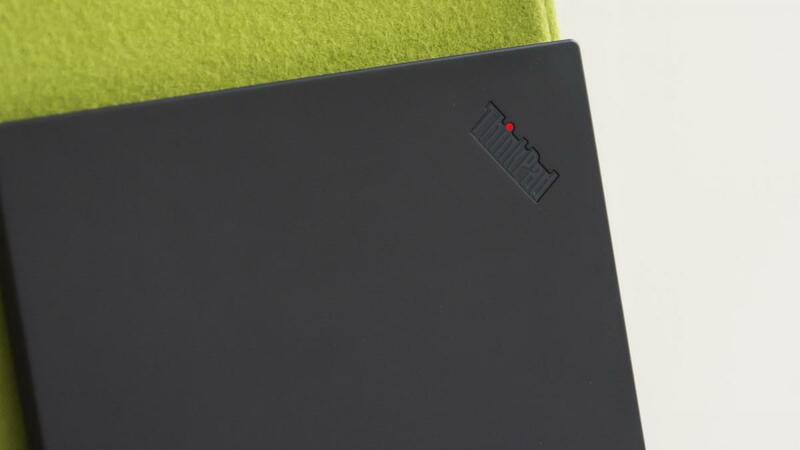 The laptop’s base surfaces also have a rubberised veneer which makes for a pleasant feel and an easy, no-slip grip. Lenovo is known for its excellent hinges, and this one is lovely too, bending smoothly within a 180 degree range. The ThinkPad X1 Carbon weighs a featherlight 1.13kg, the same as the fifth-gen model, and with dimensions of 324 x 217 x 16mm, it’s literally only a couple of millimetres bigger. Yet the new version still has room for a plethora of connectivity outlets, squeezing in two USB3 ports, HDMI and USB-C sockets for video output, a 3.5mm audio jack and another USB-C slot for charging. Then there’s the ethernet extension adaptor, nestled beside the Thunderbolt 3 connector. Hidden away on the rear edge of the laptop’s base is a slot for a microSD and micro SIM, which fits in nicely with its LTE-A receiver. I almost missed it completely at first because it cannot be seen when the laptop lid is open. 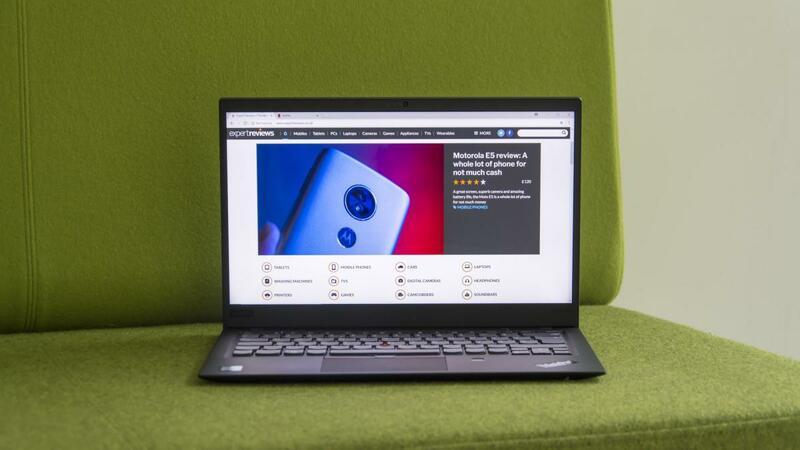 This connectivity is a cut above the standard ultraportable, and it goes to show that Lenovo is thinking about the requirements of modern businesses when designing its laptops. The same can be said for the efficient fingerprint reader, placed to the right-hand side of the trackpad. A new addition for 2018 is the ThinkShutter, Lenovo’s name for its built-in sliding webcam cover. It’s certainly nifty, but this type of basic privacy protection should really be a base requirement of any laptop being made today. Heat distribution seems to an issue with the 2018 X Carbon. The base is noticeably warm at times, even during light use. When typing or holding my hand above the centre of the keyboard I could really feel the heat, and on the top three rows especially. It came and went, though, and did not affect my working. 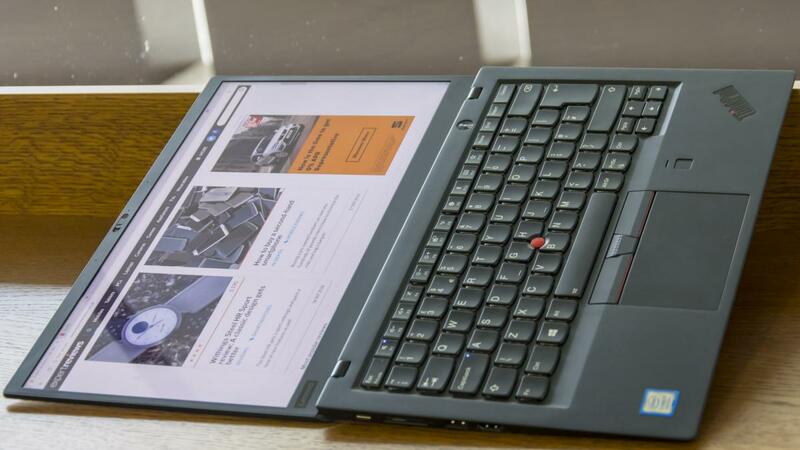 The ThinkPad X1 Carbon’s chiclet-style keyboard doesn’t seem to have changed at all. Then again, who would want it to? The keys have a subtle curve, are spaced out comfortably, and key travel is highly satisfying. Typing on the X1 Carbon is a beautiful experience, and one I will miss dearly. The sound, the feel, the flow; it’s what all laptops keyboards should aspire to. By pressing Fn and hitting spacebar, the keyboard backlighting can be made brighter or switched off. 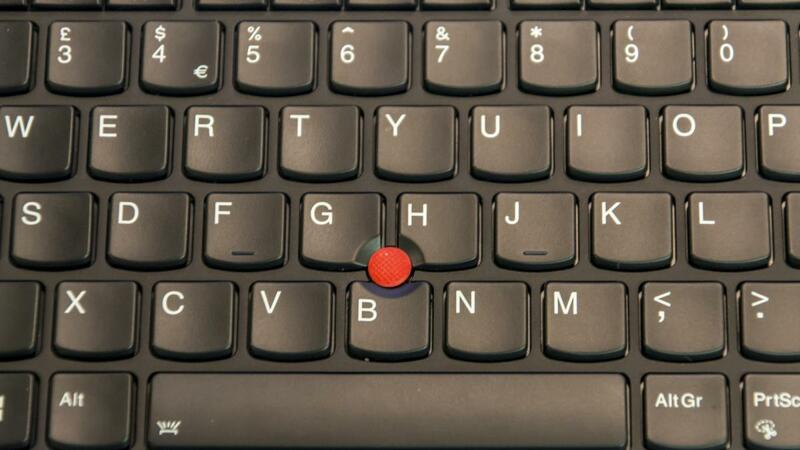 The ThinkPad is a legacy line which has maintained certain features over the years, including its iconic red TrackPoint. This pressure-sensitive pointer control is embedded between the G, H, and B keys, eating slightly into their corners but not enough to have an effect on type-feel. 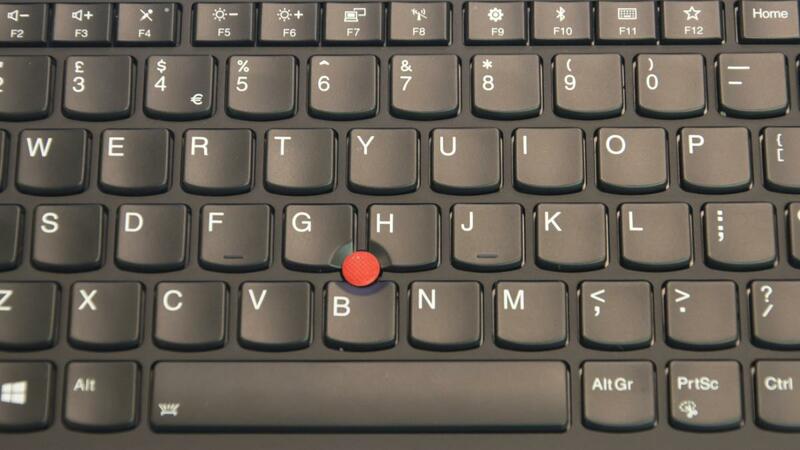 I did not make as much use of the TrackPoint as some might; I have grown up using trackpads, and find the adjustment to the little red joystick difficult. Even still, I can see why it is useful, enabling the user to move the cursor or scroll without removing their hands from the keyboard. After lowering the sensitivity of the TrackPoint to the lowest possible speed, I was able to command it more accurately. In fact, my biggest problem with the keyboard layout is the lack of separation between the arrow keys and the page up and page down buttons; I ended up accidentally pressing the wrong one enough times for it to get annoying. For the most part, the the trackpad was perfectly serviceable, but sometimes when scrolling down it simply stopped tracking. Taking my hand away, moving the cursor around a little, and then going back to the scrolling function seemed to do the job. 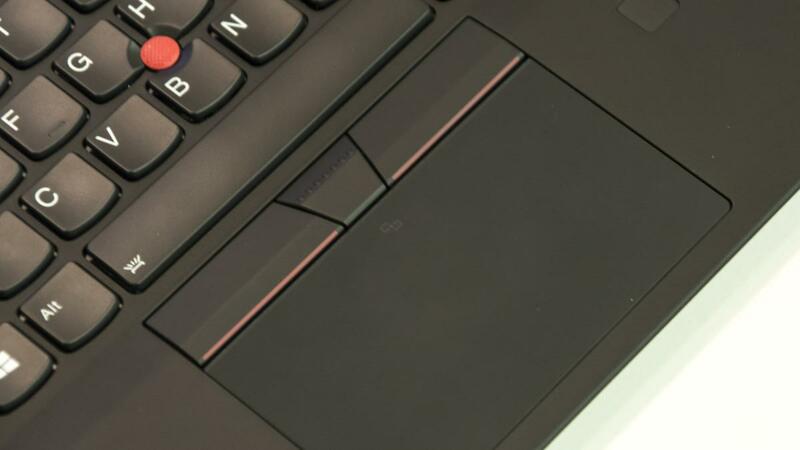 The inclusion of real, pressable buttons above the touchpad is one of the ThinkPad’s nicest design features but, for those who want to stick with what they know, the tap-to-click function of the touchpad works equally well. One of my colleagues who used the X1 Carbon found that, after a full restart of the laptop, the trackpad would lag behind finger movement and totally fail to register taps as clicks. The only solution to this irritating niggle was to close the lid for two seconds, let the X1 Carbon go to sleep, then open it back up again – problem solved. It doesn’t happen often enough to ruin the laptop, but it shouldn’t happen at all in a machine of this price. It’s also very odd considering how solid this ThinkPad is otherwise. As with the fifth-gen X1 Carbon, the 2018 ThinkPad X1 Carbon has a 14in IPS display with either a Full HD or Quad HD resolution. The model reviewed here was the Quad HD, 2,560 x 1,440 non-touchscreen version. Though they have the same number of pixels, the display of the sixth-gen X1 Carbon has made some serious improvements over last year’s. Firstly, the sRGB colour gamut coverage has shot up to 99% from 82%, and the maximum recorded brightness is a blinding 526.9cd/m2; a major step up from the previous edition’s 312cd/m2. While the old model was perfectly adequate, you can now confidently take your X1 Carbon outdoors to work without worrying about sun glare. The impressive contrast ratio of 1,525:1 also adds to the screen’s vibrancy. Colour saturation, however, wasn’t quite as good. While the ThinkPad X1 Carbon managed to faithfully reproduce most colours with a reasonable degree of accuracy, saturation levels shot up massively for greens and blues. An average Delta E of 4.56 reveals how imprecise most of the colours are. This does not mean that the screen looks bad – in fact, it looks fantastic – but it will be a problem if you edit photos or video for a living. The 2018 ThinkPad X1 houses a quad-core 1.8GHz Intel Core i7-8550U, a generational step up from the 2017’s Intel Core i7-7500U. This chip is a Kaby Lake R – a regeneration of the last Kaby lake generation, rather than a new generation of its own. And, as you know already, it’s the same processor found in the Huawei MateBook X Pro and new Dell XPS 13. This explains why the 4K benchmark speeds of the three laptops are so similar, but it would appear that the Dell XPS 13 is the best at avoiding throttling; it scored speeds of 96 over the X1 Carbon’s 80. 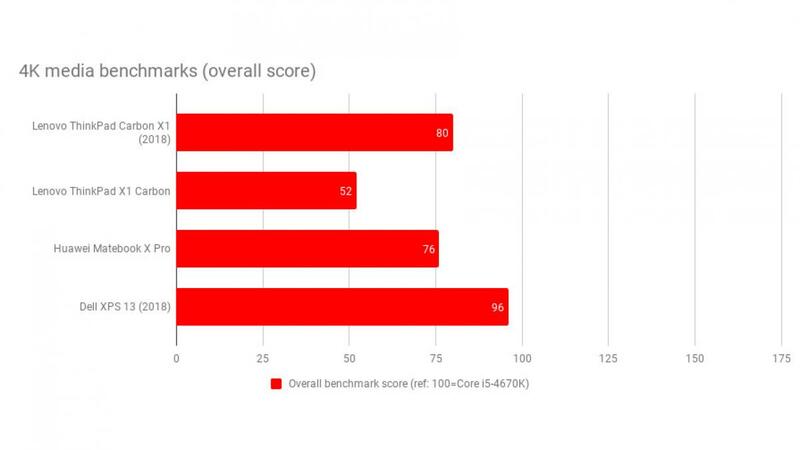 In fact, the X1 Carbon’s performance was much closer to that of the Huawei MateBook X Pro’s 76, which really paints the latter in a good light considering that it’s £500 cheaper. Read and write speeds in the X1 Carbon are definitely up to scratch, with read speeds of 2,400 MB/s and write speeds of 1,755 MB/s. 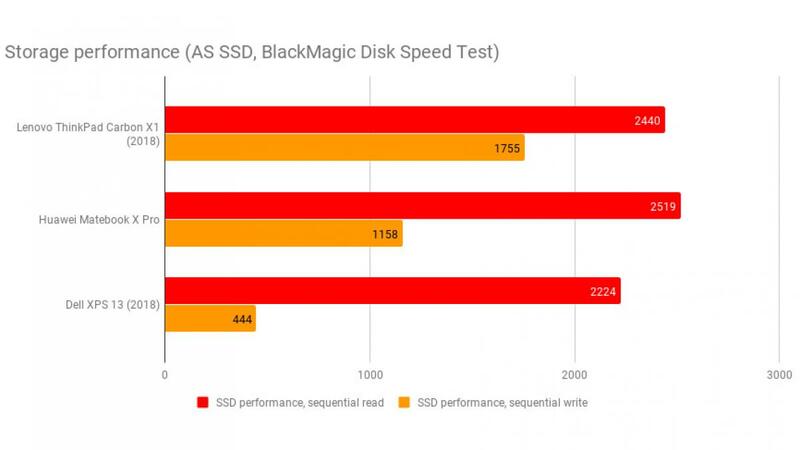 The 512GB PCIe SSD of the X1 Carbon manages to best the Dell XPS 13’s NVMe equivalent in the AS SSD benchmark. 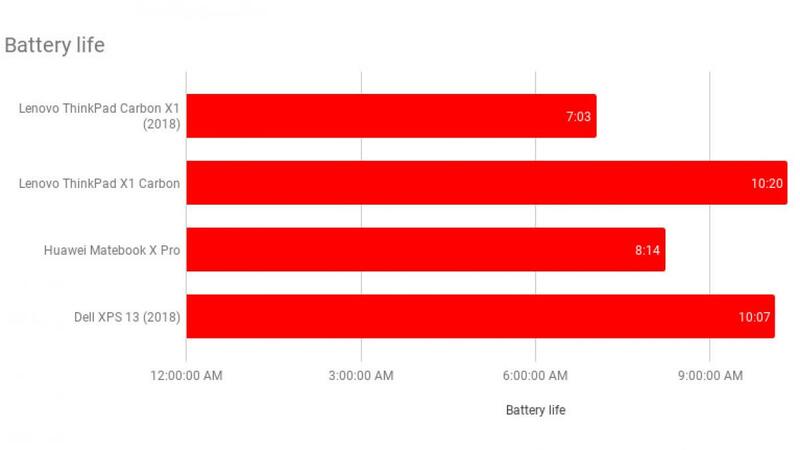 As you can see in the chart above, however, the Huawei MateBook X Pro was that little bit faster. After all this goodness, the lacklustre battery life of the Lenovo ThinkPad X1 Carbon comes as a surprising disappointment. The 2017 model lasted for over 10 hours of video playback, and I had expected the 2018 update to at least match this, if not exceed it. Instead, it dropped by 3 hours, running for just 7hrs 3mins. When using it for work, the X1 Carbon should see you through a full day, and you can still count on it play two or three films on a long journey before the battery dies, but this is a big step back from where it was. As much as I love the ThinkPad X1 Carbon, it’s not the best laptop in its price range. And cost is what it’s all about. The Dell XPS 13 has similar benchmark scores, a prettier design, and a longer battery life for £200 less. Meanwhile, the Huawei MateBook X Pro, another formidable contender with equally powerful specifications and a higher quality display, is a whopping £500 cheaper. Why would you choose the 2018 X1 Carbon over those alternatives? First of all there’s the keyboard. 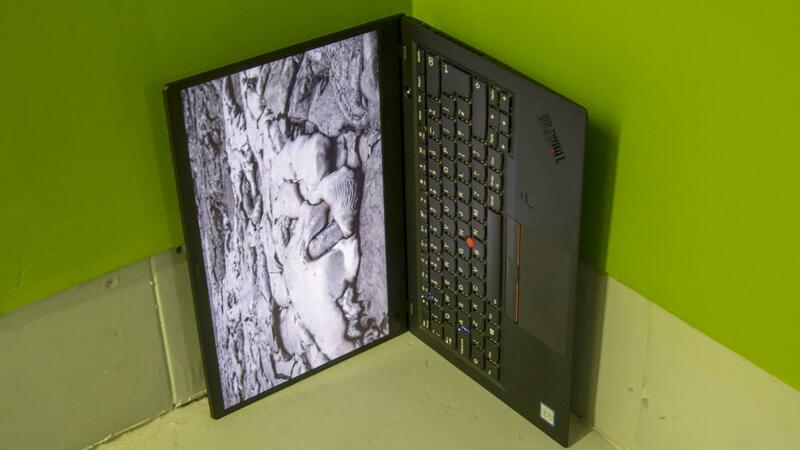 Type on an X1 Carbon for a day, and you won’t want to look at another keyboard, let alone touch one. For professional or frequent writers, this is a huge plus point. 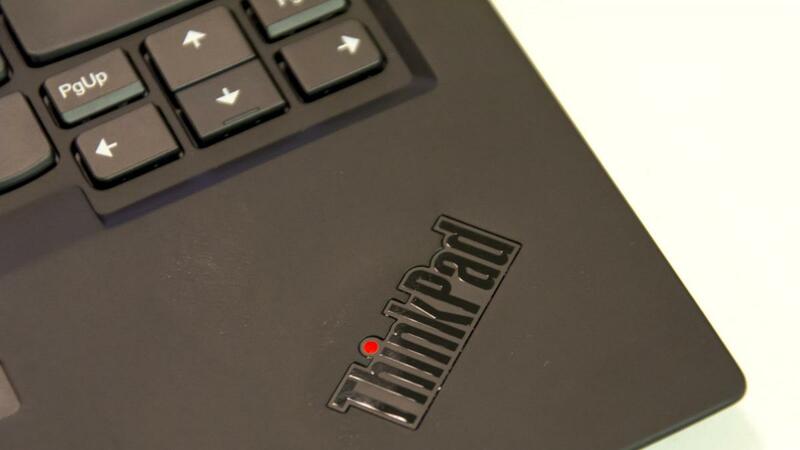 Fans of old school design will also appreciate the TrackPoint mouse and buttons above the touchpad. 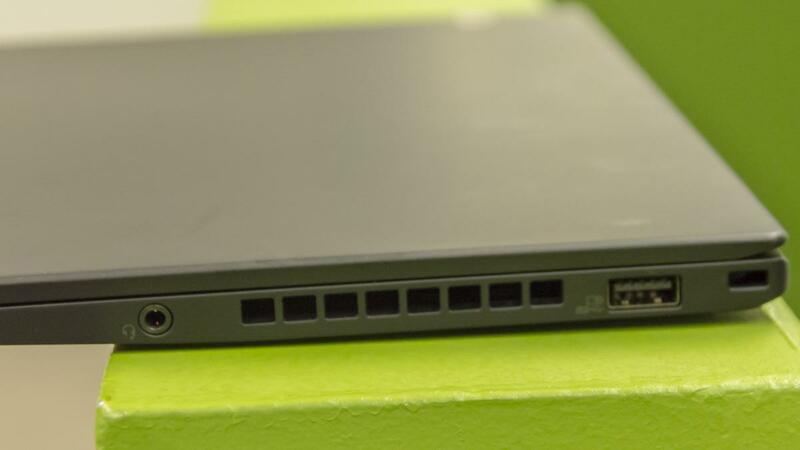 Then you have the business-focused features, including its impressive arsenal of connectivity ports, the fingerprint reader and web-cam cover. 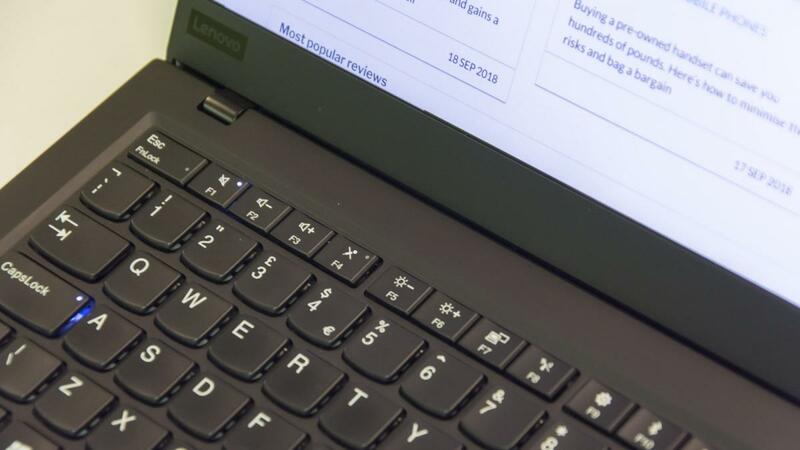 It’s expensive, true, and it has a couple of niggles, but the 2018 Lenovo ThinkPad X1 Carbon is still an outstanding business laptop with top notch specs and speeds and a classic, high-quality design.